Use sandbags to help reduce the impact of flooding on your home. The tips in this article are based on structures that are built on concrete slabs. Flood water can contain many hidden dangers. Including Raw Sewage, Trees, Chemical Waste and deadly debris. Even shallow water can move quickly enough to knock you off your feet so be careful. Sandbags will not stop the water completely but can reduce the amount of water entering the home. They can also be used to block inside drains that are at risk of backflow such as toilet bowls and shower drains. You are best placed to decide when there is a need to sandbag the home. This is based on local knowledge and past flood events. Weather warnings may alert you to the need to start sandbagging. Only use sand to fill the sandbags and only fill about 2/3 full. Do not overfill or the bags will be too heavy. The ideal bag size is 14 x 26" and are readily available online at interbulkexpress.com. Hardware or garden supply stores. A filled sand bag can weigh 30 to 35lbs. The top of the bag can be tied for transport but must be untied before being laid. Use 2 or 3 people teams to fill sand bags. Most homes can be protected with less than 100 sandbags so it is highly recommended to have sandbags stored at home available for use at any time. Building a sandbag levee or wall is achieved by laying the bags like brick work. Please see "How to Build a Sandbag Levee" for more details on single stack vs pyramid levee designs. Place a small sandbag wall across doorways. Stack at least 2 bags high. Additional layers may be needed depending on the anticipated flood level. 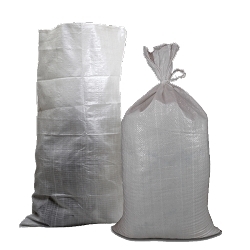 Sheeting may be used under the bags to reduce the seepage of water through the sandbags. Make sure you have at least one doorway to enter and exit the house. For outward facing doors this can be achieved by constructing a wall in a semicircle allowing the door to be opened. The same method is used when protecting garage doors and sliding doors. These will require additional sandbags and may require several extra layers. Cover drain holes in the home to stop the backflow of contaminated water. Shower, bath, toilets and floor drains are examples. Air vents in brick work will also require sandbags to seal. Sandbags exposed to floodwater will need to be disposed of properly and safely. Care should be taken when handling wet sand bags. Flood water can contain waste and dangerous chemicals. Make safety priority.